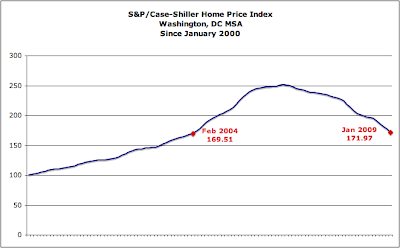 The S&P/Case-Shiller Home Price Indices report for January 2009 was released two days ago. The headline says it all: "The New Year Didn’t Change the Downward Spiral of Residential Real Estate Prices"
"Home prices, which peaked in mid-2006, continued their decline in 2009,” says David M. Blitzer, Chairman of the Index committee at Standard & Poor’s. “There are very few bright spots that one can see in the data. Most of the nation appears to remain on a downward path, with all of the 20 metro areas reporting annual declines, and nine of the MSA’s falling more than 20% in the last year. Indeed, the two composites are very close to that rate and have been reporting consecutive annual record declines since October 2007. The monthly data follows a similar trend, with the 10-City and 20-City Composite showing thirty consecutive months of negative returns." 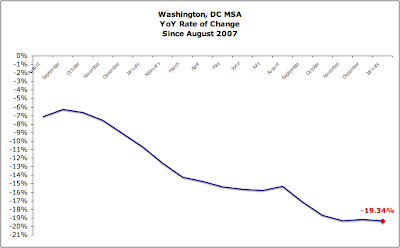 As of January 2009, average home prices across the United States are at similar levels to what they were in late 2003. From the peak in the second quarter of 2006, the 10-City Composite is down 30.2% and the 20-City Composite is down 29.1%. ...Seven metro areas and the 20-City Composite recorded a record monthly decline in January. In addition, seven metro areas (not always the same seven) reported declines in excess of 4% in the month of January alone. Phoenix led with a report of -5.5%. 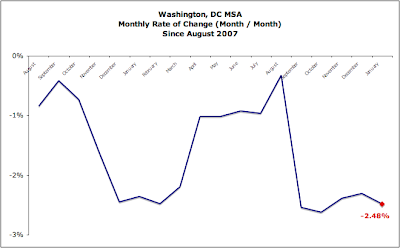 Every MSA has had at least five consecutive months of decline, dating back to September 2008.